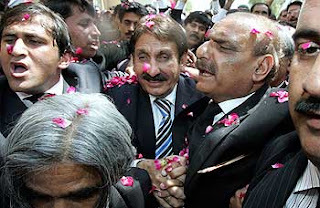 ISLAMABAD, July 21 (AFP) Jubilant crowds Saturday celebrated the reinstatement of Pakistan's top judge Justice Iftikhar Mohammad Chaudhry after the Supreme Court of Pakistan overturned his suspension by President Pervez Musharraf. The top judge’s victory Friday sparked immediate festivities outside the court, with crowds of lawyers dancing and throwing flower petals. 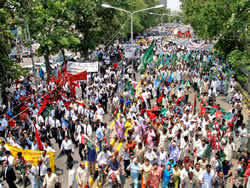 Thousands of lawyers and opposition activists also took to the streets of major cities Karachi, Lahore and Multan Saturday in more jubilant rallies, chanting “Go, Musharraf Go!” and calling for free and fair elections. “Our struggle for the cause of true democracy, rule of law and supremacy of the constitution will continue,” said Zulfikar Bukhari, head of Lahore's main lawyers' group as some 3,000 people rallied in the Punjab capital. ISLAMABAD, Pakistan, July 21 (AP) Pakistan's chief justice Justice Iftikhar Mohammad Chaudhry resumed his official duties from his residence in Islamabad Saturday. 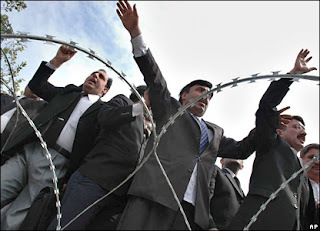 He resumed his duties to the cheers of hundreds of rallying lawyers, who also demanded that President Musharraf resign. There was also a small rally in Lahore. Supreme Court judges voted unanimously to restore Justice Iftikhar Chaudhry and 10-3 to quash charges of misconduct Friday that President Musharraf had sent to a separate judicial tribunal. Cheers from black-suited lawyers, who have led mass protests against President Musharraf since he suspended Justice Iftikhar Chaudhry on March 9, reverberated through the high-roofed courtroom after presiding Judge Khalil-ur-Rehman Ramday announced that the judge's suspension was "illegal" and set aside the charges against him. Can you imagine our country's lawyers rising up and leading a popular movement in defense of the Rule of Law? Or can something like that only happen in poverty-stricken countries where where Islam is taught in the schools and one whole day without a suicide bombing is considered good news? In other words, if the people of Pakistan can get out in the streets in numbers, on a regular and sustained basis, in defense of their "democracy" -- in a country ruled by a General -- what's the matter with us?